After an absence of around 400 years, common cranes (Grus grus) are once again nesting on the Levels. These magnificent birds were once a common sight in wetlands across the UK. Unfortunately, they were also a popular dish at medieval banquets; in 1465, the Archbishop of York served 204 roasted cranes. Eventually, hunting, combined with the loss of their wetland habitat, drove them to extinction sometime in the 1600s. In 1979, three migrating birds were blown off course and ended up in Norfolk. Since then, a successful reintroduction programme has boosted numbers to around 160 birds. Across the Severn Estuary on the Somerset Levels, 93 cranes were released at the RSPB’s West Sedgemoor Reserve between 2010 and 2014, as part of the Great Crane Project. Two of these birds, named Lofty and Gibble, eventually crossed the Severn. In 2016, they successfully bred and raised a single chick called Garan. Cranes have a long history on the Gwent Levels going back thousands of years. Footprints of cranes, along with other waterbirds, preserved in the mud on the foreshore at Goldcliff have been dated to around 5000 BC. Crane bones were discovered during excavations of a Roman well at Caerleon. The bones showed clear butchery marks, and cranes are known to have been a favourite dish of well-to-do Romans. A small red jasper amulet discovered in the Caerleon fortress baths appears to show a crane. Look out for common cranes from early spring through to late summer. The birds are grey, with a black and white head and a red crown. They are tall birds, standing between 1 to 1.3m (3-4ft), with a wingspan of up to 2.4m (almost 8ft). They are most usually seen feeding in fields, where they eat seeds, roots, insects, snails and worms. 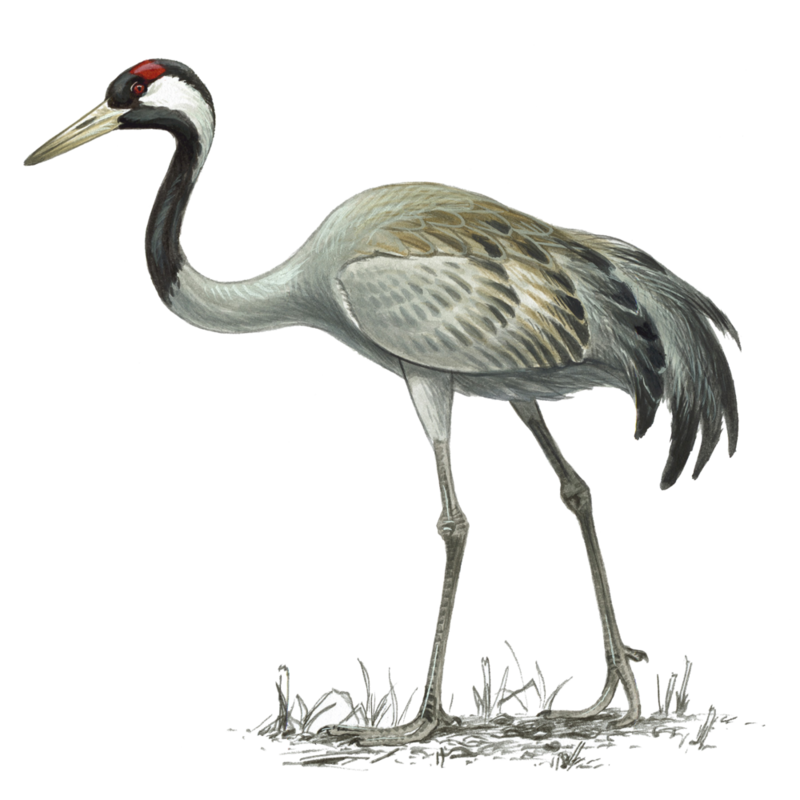 Cranes are noted for their elaborate courtship dance, which includes bobs, bows and pirouettes, accompanied by a range of distinctive calls. Although crane pairs remain together for several years, they re-enact the courtship dance each spring.